Michal Galdzicki, chief science officer for the new HiveBio community lab in Seattle, looks through a spreadsheet listing the boxed equipment in the group's new space. 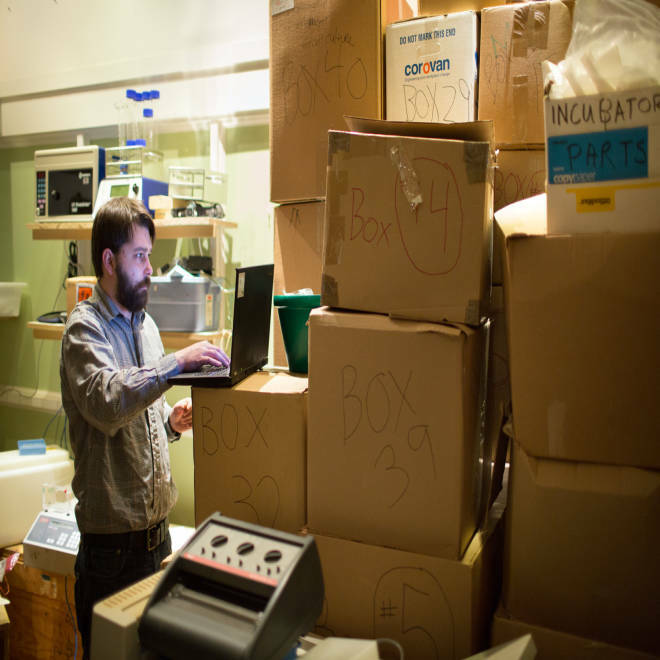 SEATTLE — Right now it's a storeroom filled to the ceiling with cardboard boxes and cast-off gizmos, but HiveBio's hacker space is being transformed into the latest frontier for a nationwide DIY biotech movement. Fueled by crowdfunding, grants and membership fees, community labs like HiveBio are delving into what's arguably the 21st century's hottest scientific frontier. Once, projects such as DNA barcoding, biofuel-producing bacteria and glow-in-the-dark organisms were the exclusive domain of professional researchers. Now they're also the domain of amateurs — including Katriona Guthrie-Honea, a 16-year-old student at Seattle's Ingraham High School who is one of HiveBio's founders. "When you open up access to biotech and biology, people understand it more," she told NBC News. "They're also less afraid of it." Guthrie-Honea and Bergen McMurray, a biotech-savvy artist, started working on the HiveBio project several months ago. McMurray drew upon her hacker connections to find the room that will serve as HiveBio's first headquarters, inside Hackerbot Labs' warehouse in Seattle's SoDo industrial area. She also got her hands on boxes and boxes of donated equipment and supplies. Guthrie-Honea, meanwhile, raised $6,425 through a MicroRyza crowdfunding campaign to pay the rent. Now they're unpacking the boxes, setting up a thermocycler to do amateur DNA analysis and getting ready to open for business sometime in the next month. Anyone 16 or older will be able to use the lab if they pay HiveBio's membership fee (as low as $50 a month) or a $15 drop-in fee. Scores of people are on HiveBio's mailing list for the grand opening. "We are already looking into a bigger space," McMurray said. 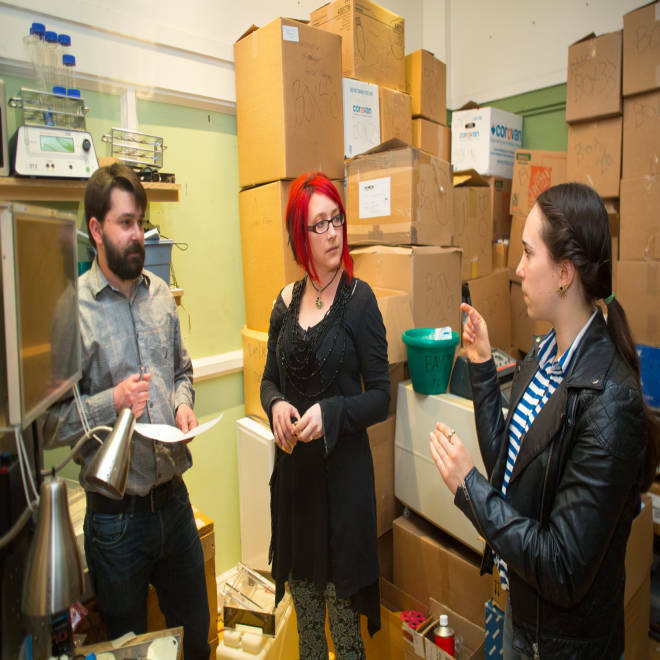 At HiveBio, a new DIY biology lab getting set up in Seattle, chief science officer Michal Galdzicki talks with co-founders Bergen R. McMurray and Katriona Guthrie-Honea. HiveBio and the other biolabs are attracting attention from schoolkids and retirees, from techies who want to build a cool gizmo and entrepreneurs who want to build a cool startup. But they're also attracting attention from the FBI, due to the potential for bioterrorism. "We don't view them as threats themselves, but they are in the domain of entities that could be exploited for nefarious activities," said Nathan Head, an FBI agent with a Ph.D. in microbiology who works for the bureau's Weapons of Mass Destruction Directorate. For the past three years or so, Head has been building relationships with biohackers and putting out the word that the FBI is on their side. "We need assistance from the community," he told NBC News. "It's like, 'If you see something, say something.'" The hackers appear to be getting the message. "With one or two missteps to the contrary, the FBI has been a huge supporter," said Raymond McCauley, co-founder and chief architect for the BioCurious community lab in Sunnyvale, Calif.
"There's a potential for bad stuff to happen, and the way we're going to deal with that is to have a cadre of people who know how to handle this," McCauley told NBC News. "We want to let a thousand flowers bloom. We want to help people improve their environment and serve as watchdogs in case bad things happen." Bioterrorism isn't the only concern: One of the ventures that took root at BioCurious is the Glowing Plant project, which has garnered almost $400,000 in Kickstarter pledges to create a glow-in-the-dark plant. The project's team members plan to graft snippets of DNA from a bioluminescent bacteria into a common mustard plant, grow the hybrids in a greenhouse, and send thousands of seed packets to their supporters. The concept set off alarm bells among environmental groups. The Friends of the Earth and the ETC Group sent a letter to Kickstarter, urging the cancellation of what they called a "controversial and risky" campaign. The head of the Glowing Plant project, Antony Evans, said his team has been in contact with the U.S. Department of Agriculture, which regulates genetically engineered plants, and will comply with whatever is legally required. "We are taking great care to make sure that nothing we do is going to create any kind of agricultural problem," he told NBC News. Nevertheless, the issue has stirred up a debate at BioCurious. "It's been a little divisive," McCauley admitted. "Some of the professionals are saying, 'Hey, this is not the way this should be done.'" Evans said Glowing Plant is considering alternate quarters for its lab work. Because of the potential for missteps, community labs are careful about following safety standards. Seattle's HiveBio, for example, plans to follow the guidelines for Biosafety Level 1, which means no experiments involving human pathogens will be allowed. "It's like an advanced biology lab ... if you went to a really nice high school," Guthrie-Honea said. HiveBio is considering projects that go beyond the scope of your typical high-school biology class, however. The top item on the agenda is a study of variations in a gene known as DRD4, which plays a role in dopamine regulation and has been linked to conditions ranging from ADHD to promiscuity and liberalism. The lab also plans to offer introductory classes for folks who want to learn the basics about biotech. Education may well turn out to be the biolabs' biggest benefit, said Daniel Grushkin, one of the founders of New York's Genspace community lab. "You can take some DNA from a jellyfish, and you put it in bacteria, and the bacteria almost overnight starts to fluoresce. ... Going from that to curing cancer or the next superbug is an exaggeration beyond exaggeration," Grushkin said. "On the other hand, this is a great step in public education and public outreach." And who knows? Just as a couple of guys working in a garage accelerated the computer revolution in the 1970s, a couple of gals working in a community biolab may supercharge the biotech revolution. "There is no telling where exactly the next big idea will come from," George Goodno, director of state policy communications for the Biotechnology Industry Organization, told NBC News in an email. "There is always the possibility it may come from someone tinkering in their homemade laboratory. Ultimately, good science tends to get funded and advanced regardless of its origin." How will geneticists get along with Mother Nature?